Drop or Fall is a classic Falldown game with graphical and gameplay enhancements. Drop Down in Real 3D with funny characters and enjoy the exotic scenery and conquer the 3D Drop Down World! 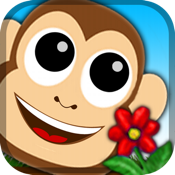 ★ JUNGLE: follow the little monkey on his adventure to the bottom of the hazardous rain forest. ★ SPACE: go on a journey with mother earth and together you will boldly go where no man has gone before. Roll down like a ball master and collect as many coins as you can. Use your coins to unlock new achievements and levels. Drop or fall the dropdown and falldown game is similar to the classic jump up or drop down games you already love. The goal is to drop down like a water drop in a rain forest and collect as many items and coins as possible on your way down. Make your device into a crazy dropbox with this item and fruit collecting jump, fall and roll game. This App is under active development! If you have any problems or want to drop a line to the developers, please don`t hesitate to write an email to: apps@modern-alchemists.com. Drop or Fall is a so called lite or freemium version. You can play the whole game without any cost but you may also buy some extra coins to cut some corners. We will never collect any personal data. Data collected by Flurry is anonymized and will be used by us for the sole purpose of making this game a better experience for you.